'I must confess to disappointment on my first view of Simla. 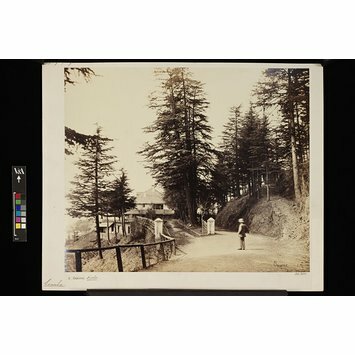 A mass of apparently tumble-down native dwellings on the top of a ridge, with bungalows scattered here and there on the sides of a mountain covered partially with fir trees, without a single yard of level cultivated land – such was the appearance of Simla at five miles’ distance, and I naturally began to wonder where I would find the series of views for which I had undertaken this long journey. All the snow had not yet (March 1st) disappeared from the top of Jakko, which is 8000 feet above the sea, and on which the English love of pure air has induced them to build their houses, even to the very summit. 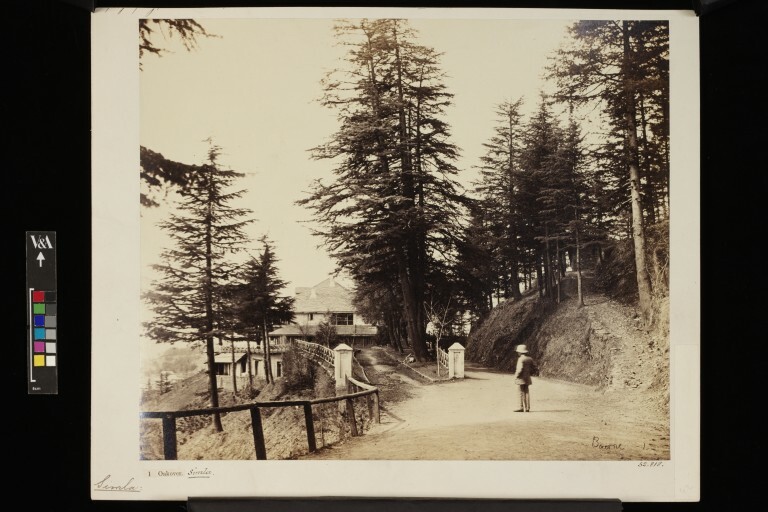 This photograph is of an European house built on the mountainside in Simla. There are trees and a path on the right hand side and an European man in the foreground. This photograph was initially part of the photographic collection held in the National Art Library. The markings on the mount are an indication of the history of the object, its movement through the museum and the way it is categorised. The mount is white. Bottom Left: Label from Bourne catalogue with some handwritten text.